Dental implants have become increasingly popular in today’s periodontal landscape. These implants act as artificial tooth roots. They are made of small titanium posts that are placed into the patient’s jawbone in the place of missing teeth. 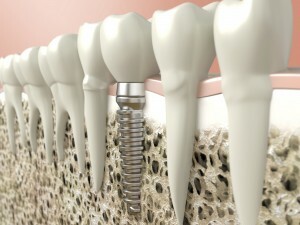 A dental implant acts as the foundation for a bridge, crown, denture, or other dental prosthesis. In the case of replacement teeth, the result is a beautiful, beaming smile that functions, feels, and looks like natural teeth. 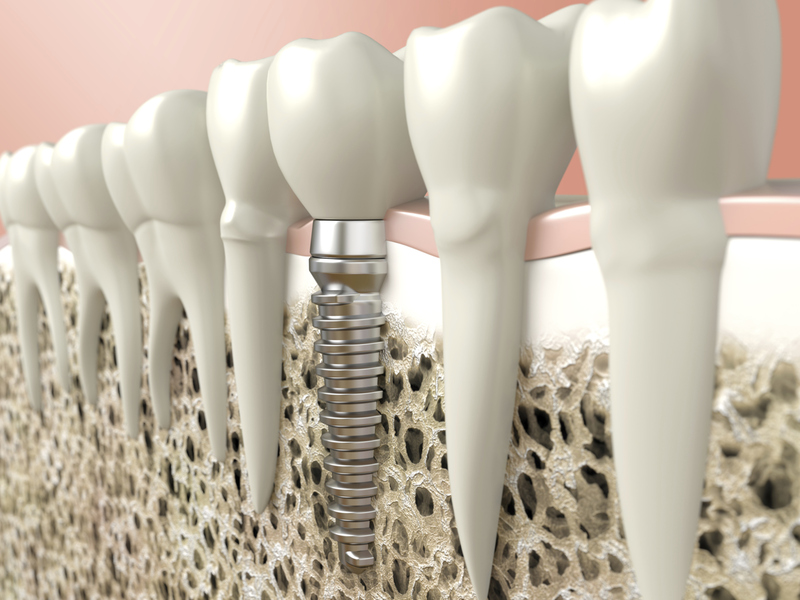 Dental implants use a biological process called osseointegration. During osseointegration, the titanium or other material used for the implant forms an intimate bond with the patient’s jawbone. After the dental implant is placed, specialists will wait a variable amount of time until the prosthetic is attached to it. This allows time for osseointegration to take place and time for the implant to stabilize and become ready for the prosthetic. It is important to understand that depending on several factors, osseointegration may not be successful. There are two main types of dental implants: endosteal and subperiosteal. Endosteal implants are in the bone, and are the most common type of dental implant. The implant is surgically placed into the patient’s jawbone to hold the prosthetic. Subperiosteal implants are placed on top of the patient’s jaw. The posts of the metal framework will protrude through the gum, which holds the prosthesis in place. Subperiosteal implants are best for patients who cannot wear conventional dentures. We ask our patients to undergo a special evaluation process to determine if dental implants are the right choice, as well as if we believe they will be successful. This evaluation includes a dental and radiology exam, as well as an evaluation of the patient’s health history. There must also be adequate bone in the jaw to support the implant. And the ideal candidates have good overall health and oral health with healthy gum tissues that are free of periodontal disease. The process of receiving implants and attaching prosthetics will typically take six to eight months and some patients may need to undergo two surgical procedures. During the first procedure, the implants are placed into the jawbone. The second procedure occurs after the site is healed, which varies from patient to patient. During this phase, the patient will typically wear temporary dentures and maintain a soft diet. Roughly three to six months later after the implant bonds to the jawbone, the implants will be uncovered and a small healing collar will be attached. After roughly two weeks, the patient’s dentist can begin creating the patient’s new teeth. When the teeth are ready, attachments or posts can be connected to the implants, and the prosthetic teeth can then be attached. Dental implants are changing the way people live. With these implants, gum disease patients are rediscovering the comfort and confidence to eat, speak, laugh and enjoy life. Dr. Sevor uses the latest technology and offers high quality dental implants at two convenient locations, serving the whole Orlando FL area. Dr. Sevor and his staff would be happy to discuss dental implants with you. Please call 407-647-2295 to arrange for a private consultation at our Winter Park office, or 407-388-0800 for our Winter Springs office.